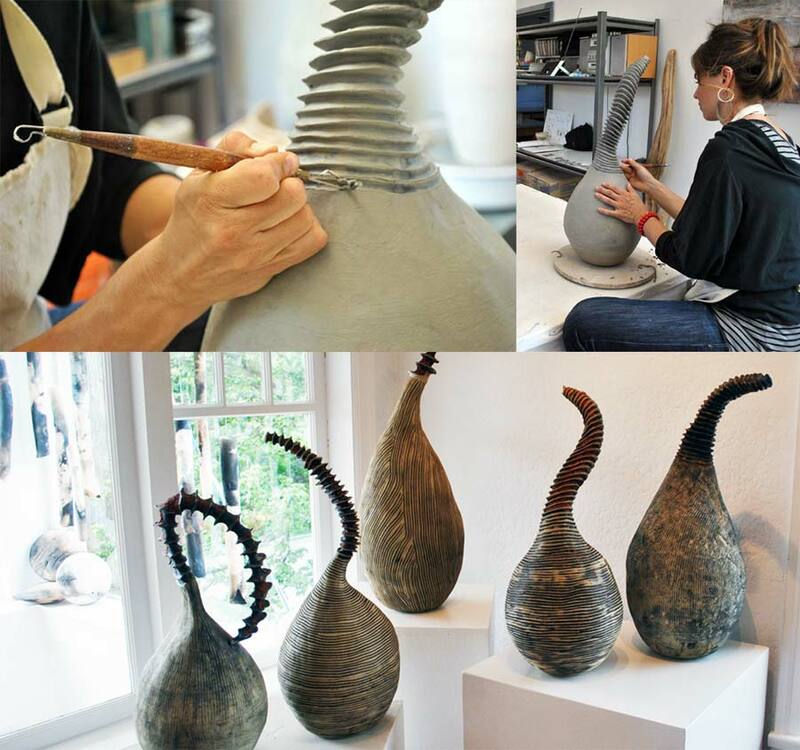 Ceramics sculptor Samantha Dickie creates organic, abstract shapes with rustic, sometimes industrial textures. The surfaces reflect her love for the raw material; the tactility, roughness and rawness of clay. Working in multiples and focusing on installation pieces, she enjoys the dialogue between art and the space it occupies, and the way groups of objects take on narratives unique to their setting. 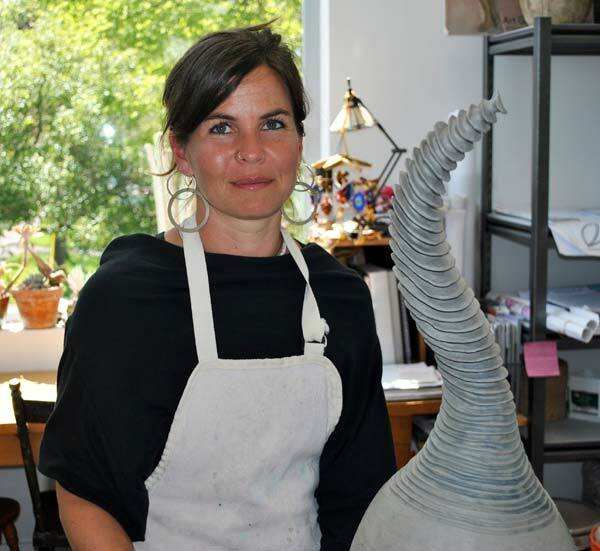 Sam’s passion for clay began at Trent University. Following the completion of her degree in Women’s Studies and Native Studies, she majored in ceramics at the Kootenay School of the Arts in Nelson, BC. Her work has been exhibited in galleries in Alberta, Yukon and British Columbia, in addition to representation in Ontario. Recently I visited Sam in her studio, where she was finishing pieces for Reclamation, her current exhibit at The Apartment Gallery in Victoria, BC, an exhibit that features both stand-alone and installation work. 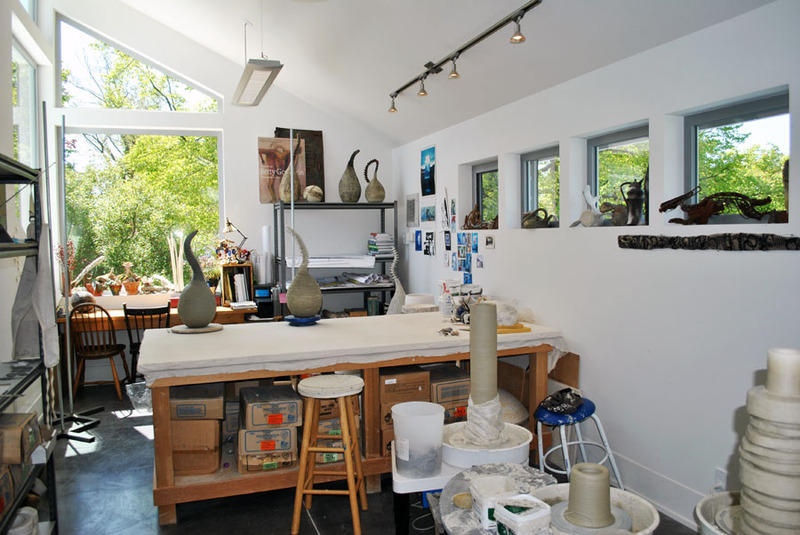 The large, light-filled, custom-designed studio on the second floor of her home is a stimulating space filled with sculptures in every stage of production, as well as collections of objects that inspire. It’s wonderful to talk with you in this beautiful setting, thank you for having me! First of all, can you tell me about a typical day in your studio? I’ve got two little kids, so my days are short. If I get three consecutive hours in the studio, I’m doing well. This time of life is a little bit challenging for getting work done. I work between the hours of 11:00 and 2:30, mostly, by the time I can really get working, and then I have to get my kids from school and the day just takes off in a different direction. It must be such an advantage, as a parent, having your studio in your home. Precisely. It’s really good at this time in my life to have a studio here. I always thought I would work in a cooperative kind of setting, I really prefer to work alongside other people. 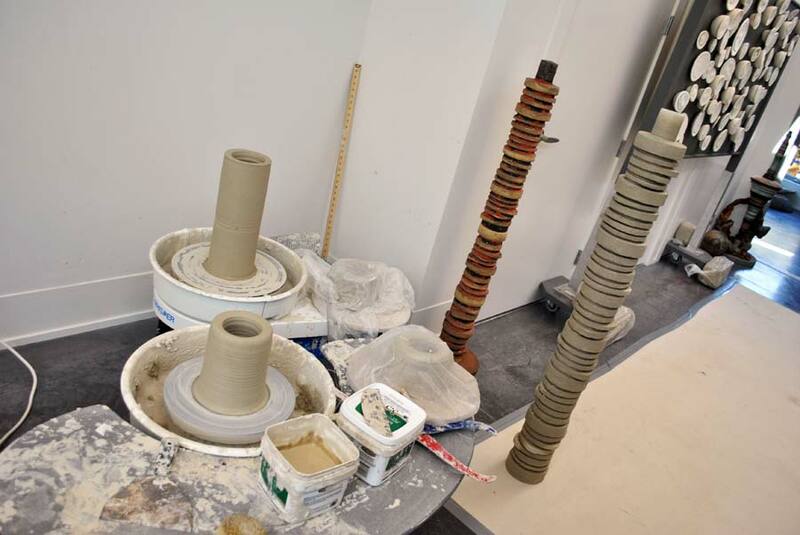 But having two kids, and particularly working with clay… the pieces dry and I have to cover them at night, and uncover them so they’re the right consistency, and I can’t do that if I have a studio somewhere else. Or I can’t manage a firing because I can’t be somewhere else for eight hours straight. And you have a kiln here, too. I have two. An electric kiln and a large gas kiln. You could only build a studio like this if you were building it during the design process for the house. The studio is on the second floor because we weren’t building new – the only extra space to go to on this lot was up, so that’s why it’s on the second floor. But it’s perfect, because I get all the natural light. I’m young now, so I can haul the 50 pounds of clay up and down the stairs… at some point it will be hard to be on the second floor but we’ll figure that out. What challenges did you have in designing the studio, given the nature of your work and materials? Clay is super heavy, but I do have extra joists under where the gas kiln is. There were specific requirements from the gas inspector that we did all the way from the paper stage of the building project. Tons of ventilation – It’s an extraction ventilation system up here, the rest is radiant heat, and the air flow up here when the door’s closed is really separate. I keep the studio clean, every week the floors are washed down. I take my shoes off when I go downstairs and keep things really separate. As far as the kilns firing, they’re both in separate rooms, separate from the studio, so there are two sets of doors and a separate ventilation system that extracts each of those kilns outside. Obviously a lot of thought went into the design. A lot of thought. But you know, working alone is sometimes challenging so I’m leaving in a few weeks to go to China to do a residency alongside artists from all over the world. I think every artist finds their way to influx their practice with other people’s opinions, critique, ideas, camaraderie and support. What’s your favourite thing about this space? Oh, the light. We put in a ton of windows, and where I was nervous that there wouldn’t be enough light I put in skylights. It was kind of crazy but I have absolutely no regrets. Also, having a messy place for my kids so we can come up here and do really dirty art projects… it’s really cool that they have this space that can get really dirty and it’s fine, the floors can take it. It feels like a very free space. Anything you would do differently or change? I guess when you talk about building houses there’s probably always a list. Next time if I could have this light, but have it on the main floor so I could drive into a garage door that would be helpful, I could do different things if I had that kind of access. But I don’t really think in terms like that, it just seems like an exercise in disappointment in some ways. It feels good, I’m really happy here. It’s a totally dreamy space, and I don’t plan to leave here. Ever. Thanks, Sam, for this behind-the-scenes tour! See more of Sam’s work on her website. 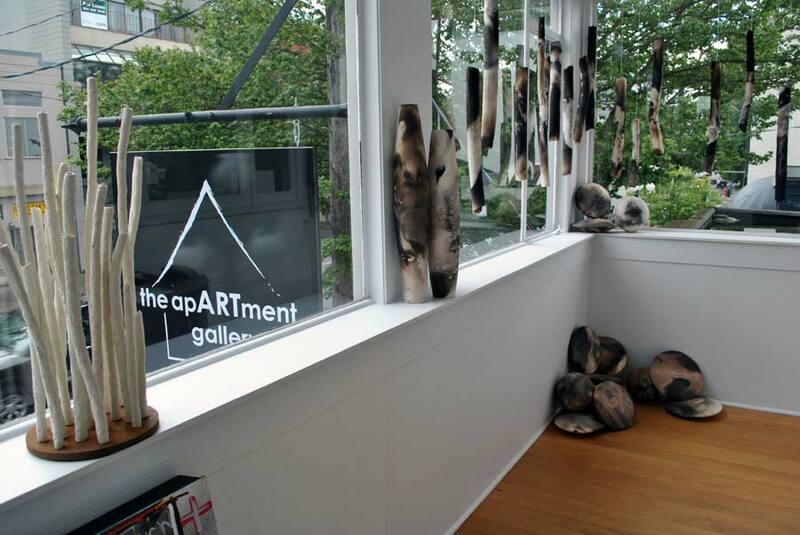 Reclamation continues at The Apartment Gallery through July 14, 2013. ← Who’s afraid of a little opera? We just put the roof on my husband’s kiln shed this weekend. We decided to use an outside shed instead of trying to use our home but it is interesting to read how the artist was able to add her studio and kiln rooms within her house with outside ventilation. Very well written article and I love the pictures too. Thanks for interviewing these artists. I also followed the link to her website. Some very nice work. There’s a lot to consider when kilns are involved – whether inside or outside the home. Congrats on your husband’s new studio, and I’m glad you enjoyed reading about Samantha’s, too! totally LOVED the article and work of artist samantha dickie…. she is the real deal! 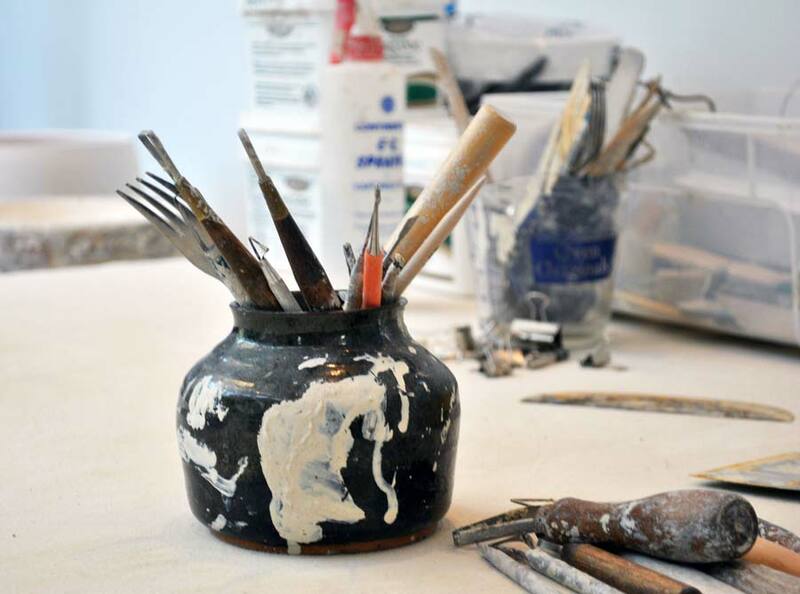 Particularly enjoyed hearing about making art in your own home studio as I do the same and when the house was built it was with the studio space in mind. also really relate to the “organic, abstract shapes with rustic, sometimes industrial textures. The surfaces reflect her love for the raw material; the tactility, roughness and rawness of clay. Working in multiples and focusing on installation”. although I have not worked in clay I certainly feel a strong connection to your process and interest in the above. thank you Kate for “finding” Samantha and sharing this with us all. Will defintely check out her site, I want one!!! That’s so interesting, Deborah… and now that you mention it I can definitely see how you would relate to Sam’s work, even though you’re both using different mediums! I’m so glad you enjoyed the interview, thanks for the comment!